Bessie Louise Whisenhunt passed away November 18th, of natural causes. She was born December 20th, 1940, on a small farm near Lenna, Oklahoma. Her parents, Leon and Okla Toler, had several children in hopes of having help with the difficulties of working a small farm. She helped raise the younger children and started doing chores at an early age. Over the years, she lost both parents, her brother Jim, sister Barbara and son Don. She is survived by her husband of over 60 years, Grady, daughters Cheryle and Kim, her husband Chaz, grandchildren Angela, Brandi, Lisa and Jessica, great grandchildren James, Kyndal, Matthew, Sam, Karli, Ashlyn, Noah, and Orrin, and her sisters Shirley, Martha, and Grace. True to her upbringing, she always put her husband, children and home before her own needs. She was a wonderful mother and grandmother! She enjoyed baking, cooking big southern breakfasts, crocheting and quilting. 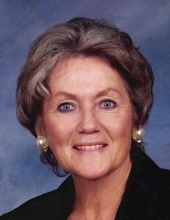 Her most enjoyable pastime was cheering on her favorite basketball and football teams. Despite her long struggles with her health and crippling arthritis, her faith in God and prayer never wavered. Some of her fondest memories were of singing at church. Our family wishes to thank everyone for their prayers, love and encouragement during the difficult past few months. Her love has blessed all our lives and we’ll cherish the memories. While searching through her papers we found this poem she copied during one of her many times in doctor’s waiting rooms. It sums up how she lived and hoped. I would rather have one flower now, than a trunk load when I’m dead. To send flowers or a remembrance gift to the family of Bessie Louise Whisenhunt, please visit our Tribute Store. "Email Address" would like to share the life celebration of Bessie Louise Whisenhunt. Click on the "link" to go to share a favorite memory or leave a condolence message for the family.